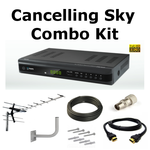 Combo self installation kits. Get the best of free UK and Irish TV with NO monthly bills!! All your favourite BBC, ITV, RTE channels and more on a single HD, PVR Ready set top box! !